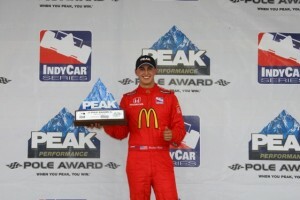 Kansas City, Kan. – Graham Rahal won the IndyCar Series pole Saturday afternoon when he recorded a four-lap-average qualifying run of 211.311 mph in qualifying for Sunday’s Road Runner Turbo 300 at Kansas Speedway. His run pushed him past Dario Franchitti, the winner of last weekend’s race at Long Beach, Calif. Or so it appeared. A half hour after the qualifying session, Indy Racing League officials announced that Franchitti would start the race from the rear of the field because he had violated rules by going below the line on the bottom of the track during his qualifying run. Also sent to the rear, apparently after qualifying third fastest, was Helio Castroneves. That sent Robert Doornbos, Rahal’s teammate to the front row for Sunday’s race. Starting third will be Danica Patrick. · Rahal’s previous best start on an oval was second last year at Milwaukee. · This is the second IndyCar Series pole for Newman/Haas/Lanigan Racing. · Robert Doornbos qualified second in his first start on an oval. His previous best start was ninth at Long Beach. · This is the 40th time in IndyCar Series history that teammates will start 1-2. The feat happened six times last year, most recently at Infineon when Helio Castroneves and Ryan Briscoe qualified 1-2 for Team Penske. · Danica Patrick qualified third, her best starting position of the season and her best since starting third last year at Chicagoland. · Scott Dixon qualified fourth, his 18th consecutive top-10 start, the longest active streak in the IndyCar Series. It is his first top-five start of the season. · Marco Andretti qualified fifth, his first top-five start of the season and his best start since fifth at Chicagoland last season. · Mario Moraes qualified sixth, his best career start. His previous best was 10th at Edmonton last year. · Dan Wheldon, the two-time defending winner at Kansas Speedway, qualified ninth. He has started second and fourth, respectively, the last two seasons. · Sarah Fisher and Milka Duno qualified 11th and 12th, respectively, in their 2009 debuts. · Dario Franchitti and Helio Castroneves were penalized for driving below the white line. They will start 21st and 22nd, respectively. · Wade Cunningham won the pole, his eighth career pole. Cunningham ranks second all-time in poles, second to 2004 series champion Thiago Medeiros, who won nine. · This is Cunningham’s first pole since Watkins Glen 2007. · This is the 27th pole for Sam Schmidt Motorsports, the most in series history. · Sebastian Saavedra qualified second, his third top-three start of the season. · Ana Beatriz qualified a season-best third. This is her eighth consecutive top-10 start, longest active streak in the series. · J.R. Hildebrand, the defending winner, qualified fourth, his fourth consecutive top-four start. · Pippa Mann qualified fifth, her first start inside the top 20. · Series points leader Junior Strous qualified 17th. It was great to see you at Kansas Speedway in the garage searching for info for us.